Think beacons can only be used as a marketing ploy? Think again. iBeacon and Eddystone beacons use cases have surfaced over the course of the year. From making lives easier to being used as a educational tool, Eddystone beacon and iBeacon have made waves in 2018. Learning more about job openings in the army is now as easy as ABC. The US National Guard is a brilliant example of how beacon use cases do not have to be limited to just in-store marketing. They use beacons by Beaconstac in 4 incredible ways. One is to gently nudge young men and women to the nearest recruiting office. The other is to push people to download the National Guard app on the Play Store. 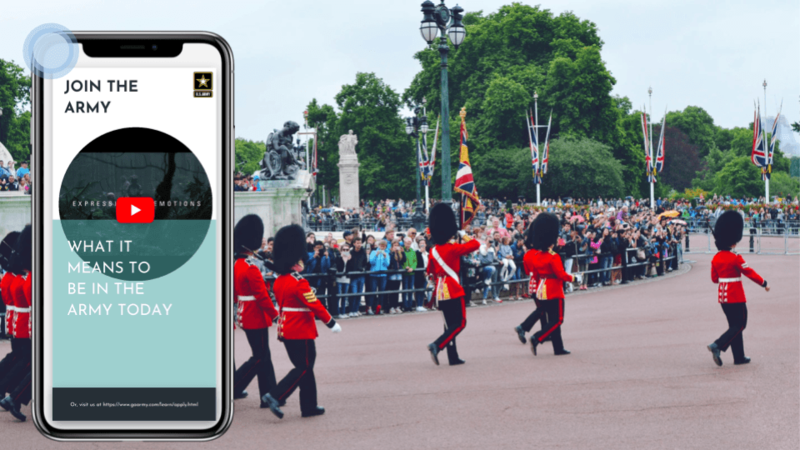 Beacons also lets citizens to know more about life in the National Guard and send invites to patriotic events happening nearby using the Beaconstac dashboard. Arista Vault identified a major problem with the way payments are made while recognizing the general human tendency to forget wallets often. That’s how Wallet-bot was born. The Wallet-bot connects to your smartphone and uses iBeacon technology to let a user know when they’ve left their wallet behind. If you go out a certain range, your smartphone will send you an alarm. This is also pretty useful to help you track your wallet if it goes missing or in cases of theft. The last known location gets stored on the app. The Wallet-bot can also be used to take selfies and to charge your phone. Navigating an unfamiliar place is tough which is why there are apps for differently-abled that make good use of beacons to help them navigate. Apps like RightHear (uses both iBeacon and Eddystone protocols), Click and Go Wayfinding and Aware Audible Wayfinding use beacons installed in various venues to triangulate the position of the user that lets them know where they are and even allows them to call for assistance. For 911 respondents, locating a distressed caller is of the topmost priority but often a caller is unable to give their details. RapidSOS backed by the FCC (Federal Communications Commission) created a technology application that uses Bluetooth beacons to accurately pinpoint the location of the smartphone to be sent to emergency respondents. Apple aims to partner with RapidSOS and roll it as a new update which means the location of iPhone users will be sent immediately to 911 operators. The dangers of solitary workers getting harmed during their work are not unknown. Getting their precise location in large, high-rise buildings is tough which is why SoloProtect ID Pro has stepped up to create a safer work environment for lone workers. This device uses Bluetooth beacons in addition to WiFi detector to pinpoint the location of workers. A worker can also raise the alarm for help using the ‘Red Alert’ feature which again uses beacons to notify responders the last known location. The project that started 3 years ago is now all set to expand to 870 stores that will notify potential customers and shoppers about their promotional campaigns both when they are near the store and/or on a particular product. They have joined forces with Join Tag which will enable beacons to communicate with shoppers with a variety of apps affiliated with Kariboo. A digital treasure hunt like no other. Jacksonville was the first one to have a national park that teamed up with Humana. The aim is to have smartphone users hunt for beacons while subtly motivating them to follow trails to workout. Humana uses Go365 and Bluetooth to find beacons where smartphone users were rewarded with e-gift cards, fitness devices, and discounts. This digital hunt is open to all ages and carried out in the historic Fort Caroline National Memorial and the rest of Timucuan Parks. The city of Fairborn in partnership with Dayton Software Mile Two has created an AR game in an attempt to boost foot traffic. While the game itself is free, it does lead players through specific parts of the city but leaves it up to the players if they wish to purchase something. Business owners can link Bluetooth beacons to the app in an attempt to get players to have coffee or a sandwich. Meanwhile, players can pause the game and get extra minutes or other incentives for doing so. Roadvert Media has developed an iRoadvert Beacon that transmits contextual messages to smartphone units as vehicle fleets travel across the country. These messages can be changed using the Roadvert Media dashboard as per the location. Roadvert enables fleet operators to generate extra income as well as predicts the audience of the advertisement. BlindWays, an app developed by Perkins School for the Blind is great for the visually impaired to help them find a bus stop. But GPS is not very accurate and can only help users navigate within 30 feet of their destination which may lead to someone missing their bus. That’s why MBTA’s collaboration with Perkins is such a wonderful beacon use case. Beacons are installed at bus stops and the smartphone vibrations get more intense as someone approaches the bus stop. In partnership with Bellevue based footmarks, Woodland Park Zoo has created an immersive experience by using Bluetooth beacons that push digital content to smartphone users. This lets the zoo offer a lot of information to visitors without plastering the zoo in signage and creates a second layer of valuable information. Have you heard of an interesting beacon use case? Let us know in the comments below. Join forces with the thousands of brands and businesses that incorporate beacon technology to offer a unique experience by choosing Beaconstac. An end-to-end solution where the intuitive dashboard allows you to fully customize your message that you can send to everyone in the vicinity of your beacon.